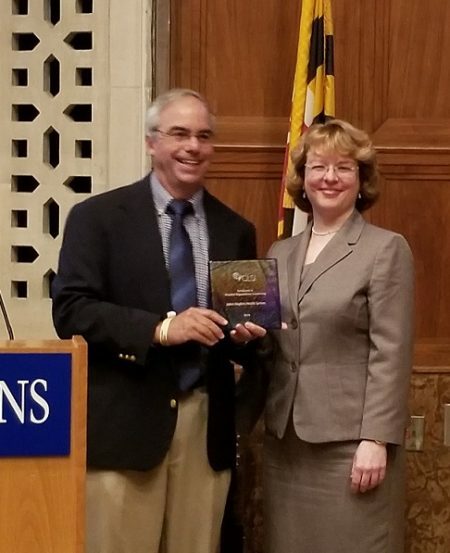 From left, Glen Fine, CLSI Chief Executive Officer, and Dr. Jody Hooper, who received the award on behalf of Johns Hopkins. Johns Hopkins Medicine was honored as recipient of the 2018 “CLSI Excellence in Member Organization Leadership Award” on April 24, 2018. This award is presented to a member organization that offers exemplary support to Clinical and Laboratory Standards Institute (CLSI) and its mission to maintain leadership in the domain of standards development. The Pathology Department has been an active member of CLSI for over 20 years, supporting the development of numerous standards and membership-related activities. Pathology employees are actively engaged in CLSI standards development projects, including authorship, voting, and advisor roles in document development committees, subcommittees, and workgroups. These individuals have provided untold numbers of volunteer hours in support of CLSI, in Microbiology, Antimicrobial Susceptibility Testing for both bacteria and fungi, Evaluation Protocols, Hematology and Ligand Assays, and Chemistry disciplines. For these reasons, the CLSI Awards Committee awarded JHM its 2018 Excellence in Member Organization Award. Current volunteers who help in CLSI standards development include: Drs. Karen Carroll, Nicole Parrish, Patricia Simner, and Sean Zhang of Medical Microbiology, Drs. Bill Clarke, Lori Sokoll, and Stefani Thomas of Clinical Chemistry; Dr. Gang Zheng of the Hematology Division; Dr. Pranita Tamma of Infectious Diseases; and Pathology clinical laboratory scientists Natalie Wallace and Audrey Gillette. Historical volunteers were Barbara Parsons, Dr. Matthew Olson, Dr. Alexandra Valsamakis, Dr. Robert Veltri, and Dr. Patrick Sosnay. Prior to the award presentation, Mr. Fine and his colleagues toured our Core Lab, Microbiology Lab, and Genomics Lab. He noted how impressed they were with our technology, particularly Phlebotomy I.T. And as part of the Department’s Lab Week activities, Mr. Fine presented a lecture in Hurd Hall about CLSI – an overview, guidelines and standard document development process. To view the presentation, please open this link, http://webcast.jhu.edu/Mediasite/Play/b7001f2df3fc4e0eaa0733c835ec6e2b1d. CLSI documents can be of enormous help to meet CAP standards because they provide a crosswalk format that matches CLSI documents to CAP standards. Our Department has committed to expanding the use of CLSI documents across our seven Hospitals. CLSI documents are used throughout the world and have input from government, industry and health care professionals. In closing, our thanks to Glen Fine for his excellent Lab Week lecture and to many people in Pathology who have worked so hard to support the important mission and goals of CLSI.